If you are visiting, please take the time to "Log In". Laid down by Todd Shipyards Seattle, WA. February 6, 1962. Launched February 26, 1964 and commissioned August 28, 1964. Stricken October 3, 1992 and sold to Greece. 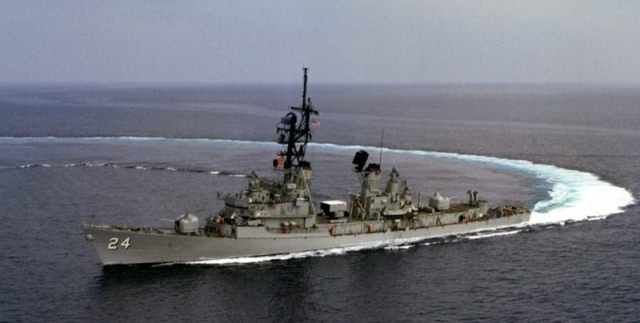 Renamed HS Nearchos D-219, Stricken July 18, 2003. Sunk off Crete May 29, 2006, the Hellenic Navy acceptance testing 2 SSMs. This website is dedicated to every shipmate that served aboard our Gallant Warship. There is an open invitation to all shipmates to share in this website. Any contribution: photos, sea stories, documents, history updates, etc., will be gratefully accepted. Contact me by E-mail and I will help make it happen.